At least 66 people are dead and more than 600 missing after California’s Camp Fire destroyed the town of Paradise on Nov. 8. Now, a new satellite view shows the beginning of the horror. This satellite image, captured on Nov. 8, 2018, by Landsat 8, shows short-wave infrared (red), which gives the full extent of the actively burning area of the Camp Fire, just four hours after it started. The red patches are fires that leapfrogged in front of the primary burn front. 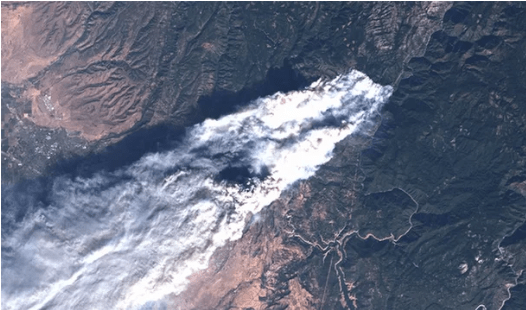 A visible-light version of the Landsat-8 image from Nov. 8, providing a view of the gray smoke billowing from the Camp Fire. Lives and homes remain in danger from a fast-moving and out-of-control bushfire heading towards a roadhouse in Western Australia’s north. A watch and act alert is in place for people at or near Pardoo Roadhouse and east of the De Grey River including De Grey Station, Pardoo Station, Goldsworthy, Shay Gap, Warralong Community and Yarrie Mine Camp in the Shire of East Pilbara. This entry was posted in Wildfires and tagged California. Bookmark the permalink.